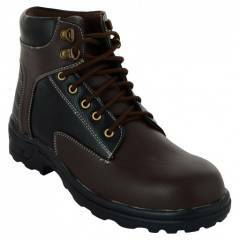 Da-Dhichi RA-06 Steel Toe Chocolate Brown Safety Boots, Size: 7 is a premium quality Safety Shoes from Da-Dhichi. Moglix is a well-known ecommerce platform for qualitative range of Safety Shoes. All Da-Dhichi RA-06 Steel Toe Chocolate Brown Safety Boots, Size: 7 are manufactured by using quality assured material and advanced techniques, which make them up to the standard in this highly challenging field. The materials utilized to manufacture Da-Dhichi RA-06 Steel Toe Chocolate Brown Safety Boots, Size: 7, are sourced from the most reliable and official Safety Shoes vendors, chosen after performing detailed market surveys. Thus, Da-Dhichi products are widely acknowledged in the market for their high quality. We are dedicatedly involved in providing an excellent quality array of Da-Dhichi Safety Shoes. Good design, stylish, comfortable shoe. Outstanding safety shoe at this price. It’s a value of money shoe.